Courtesy of Julie Sahni, Classic Indian Vegetarian Cookery. Steam cauliflower, but not for long. I only had a half left, but figured it would do. plus a tablespoon or two of ground almonds. 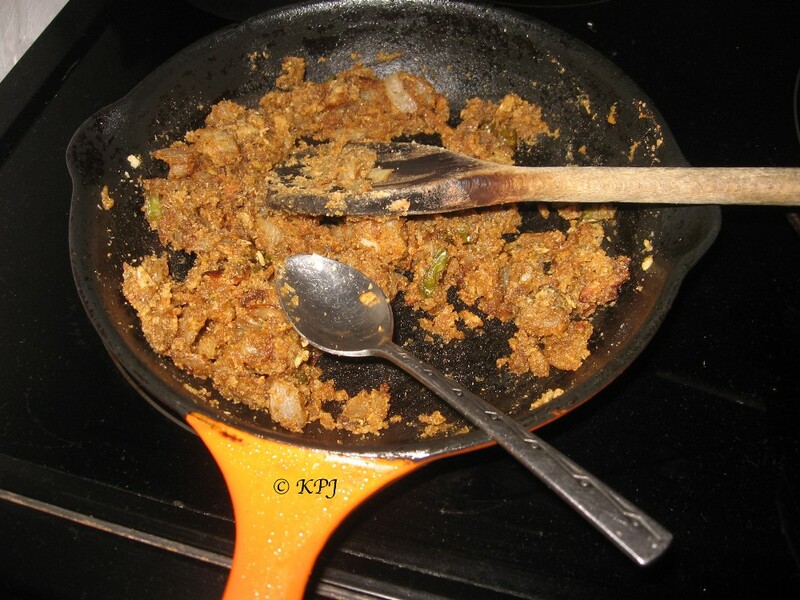 Fry the mix for a couple of minutes then add a spoon of flour, fry another few minutes, and then add 3-5 tablespoons of water to make a paste. Cook that for a few minutes and then let it cool. Stuff half the paste between the florets, and then spread the remaining half on top. Add a few drops of olive oil over the top and cook in oven until slightly crispy and glazed, say 25-30 mins. I actually pureed the sauce after I’d cooked it all as the salad dressing was in the whizzing container. Stir in fresh coriander (assuming you have some which I didn’t). I served the potatoes, cauliflower and sauce with a salad, and I used North Indian Salad Dressing with that.